Upside Down is a start-up from Iaşi, Romania that aims to help protect the environment and to persuade consumers/customers to make responsible decisions. Their story and mission began once they won the Social Impact Award competition in 2012. They create eco-friendly accessories such as slim wallets, bags, book covers and bumbags, made from old street banners and truck tarpaulin. In this way, Upside Down uses waste in a creative manner in order to bring a solution for both customers and the environment. This way of creating useful things from old, previously useless materials is called upcycling. The process is complex and different from what we call downcycling because they create accessories higher in quality than the initial materials. Upside Down’s philosophy is centred on the principle of sustainability. Moreover, the company encourages the idea of responsible shopping and tries to have a constant conversation with the customers , trying to inform them about ways they can solve environmental problems or about local or national actions which suit their values or ideas. Intro question: What is the social innovation Upside Down about? Upside Down in a social business from Romania. Our aim is to help protect the environment and to persuade customers to make responsible shopping decisions. Our mission began when we won the Social Impact Award competition in 2012. We create eco-friendly accessories, such as wallets, bags and bumbags made from recovered materials such as street banners and truck tarpaulin. Upside Down uses waste in a creative manner in order to bring a solution for both customers and the environment. This way of creating useful products from all those recovered materials is called upcycling. This is part of recycling. The process is complex and different from recycling where we actually use mechanical processes to produce something. This is known as downcycling. We create accessories of a higher quality than the initial (?materials?). Upside Down is focused on the Romanian market. We often go to different fairs and exhibitions, and we have an idea to sell our products in different countries. As I mentioned before our business began once we won the Social Innovation Award in 2012. Before that I was in Delhi in India with the AIESEC student exchange programme to get more work experience. After that I decided to stay longer in India to discover the country better but also to do what I wanted to do – voluntary work. I applied to join an NGO in Delhi where I started my voluntary experience. I became familiar with the process of converting waste in tailoring workshops from that organization. The idea was inspired by my experiences. 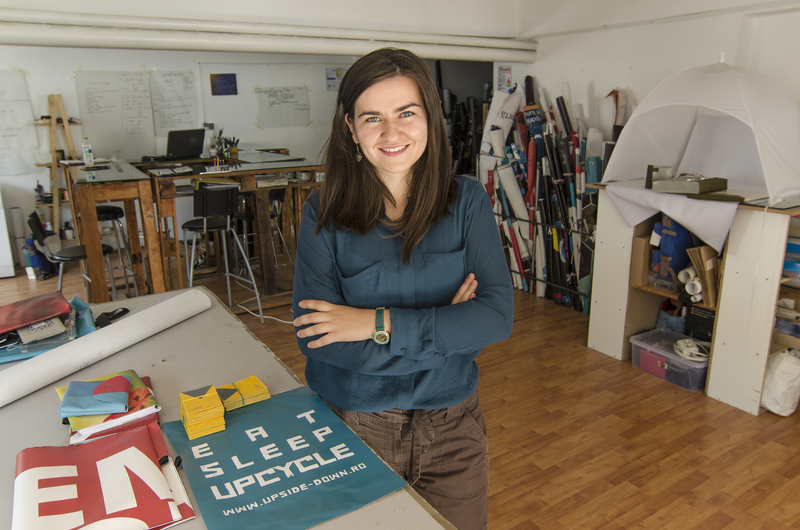 After becoming familiar and involved in the marketing and production processes, I asked myself if a business or NGO existed in Romania which was focused on the upcycling process, and at that time there wasn’t. I came back to Romania and me and my friends entered the Social Impact Award competition, and won 4,000 euros. That is how we got started. I think both. It was definitely a collaborative process. After the competition me and my friends created a business plan and we had to think about this in the long term to decide about the target group and how we were going to implement the idea. We didn’t only focus on the product but also wanted to change the mentality or system and know-how to create something from waste. From the beginning I believed in this idea completely and I didn’t have any fears. Certainly if I had any fears, I didn’t focus on them. I also knew that it was something new for Romania and we needed to test, to learn and to collaborate with other initiatives that had more experience in the social entrepreneurship field. The Social Impact Award competition played an important role in our start. We didn’t just receive money. We also received mentoring and we became part of the community of social entrepreneurs from Bucharest. Being part of the network of Bucharest really helped us . We gained money that we invested in the project. We rented the space where we have our tailoring workshops. We hired someone and we had money to pay him for two months. We receive mentoring from people more experienced than us and we also had access to a wider network. We started to collaborate with companies from Bucharest, with people experienced in creating websites and in accounting. This is how we started. The Social Impact Award competition was organised by Impact of Bucharest. They collaborate with people from the media. It was a great help because we were promoted by most of the important media channels such as magazines and online and offline newspapers. We were also promoted on social media. We had different collaborations that were very good, including associations with important music festivals in Romania. The Social Impact Award also offered workshops for different teams. One of those was in story telling. We learned a lot and also learned how to use business canvas models. There were also workshops that helped us to create business plans, to tell our story and to present our idea. You can have a great product but if people don’t understand why you do it, you will not have the results you want. Social business starts with a problem that we saw in the market; there are many existing materials which can be resourced for new products and there is nobody using these materials . This is what we wanted to do, so we started with the problem we wanted to solve and after that we focused on users. Now we are much more focused on our consumers. For example we have adapted the accessories for the Romanian market and as I mentioned previously, we focused more on this market. The product that is now the most popular and provides us with the most sales is the slim wallet. It is designed so that people from Romania can use it. It is suitable for Romanian ID cards, which are bigger that in other countries and our bags also have the perfect dimensions in order to fit the products they were created for. The idea is that we focus on practicability. We want to create products that are useful every day . We sell our products online and also to offline stores. We have distributors as we don’t have our own offline store and we also sell to companies. We have also participated in different events, fairs and festivals. This helps us to promote ourselves and to receive direct feedback from clients. We decided to focus more on two channels, offline stores and our online shop. There are many competitions which people can enter, as well as the Social Impact Award competition. Now they don’t give as much money but you receive mentoring and become part of the community and network. I believe that crowdfunding can also be very interesting. It can bring a lot of assistance , because you can see if the product is desired by people and if people are willing to buy it and give feedback. We haven’t tried a crowdfunding campaign but I think they can be good if you try to implement them . Part of our scaling is collaboration with offline stores from Romania. We deliver products to the biggest chain of libraries in Romania and this helps us to sell our products and also helps us to be present on the Romanian market. We haven’t planned to scale our social business yet, but we will do it in the future. We still have to do a lot of things. It takes time to educate and to change the whole system. I think it is important that people are more conscious about the choices that they make. They have other alternatives, other options. They can buy local products made from recovered materials, such as Upside Down products, or they can buy something made in China. It is up to them but it is important that we offer them alternatives. We think that Upside Down can be a way of thinking and acting, based on our Upside Down thinking outside of the box philosophy. We save specific materials that others don’t even think about using . I think we have made a difference on a market already full of other accessories or fashion-related brands. What it the one piece of advice you can give to an aspiring social innovator, a member of the Social Innovation Academy? I think it’s very important to be open to learning and to be honest with yourself and your team. Social innovation is about testing and pivoting. We tested the materials, the products and the business model and we are still learning a lot. We are flexible and open because that is how you make progress. 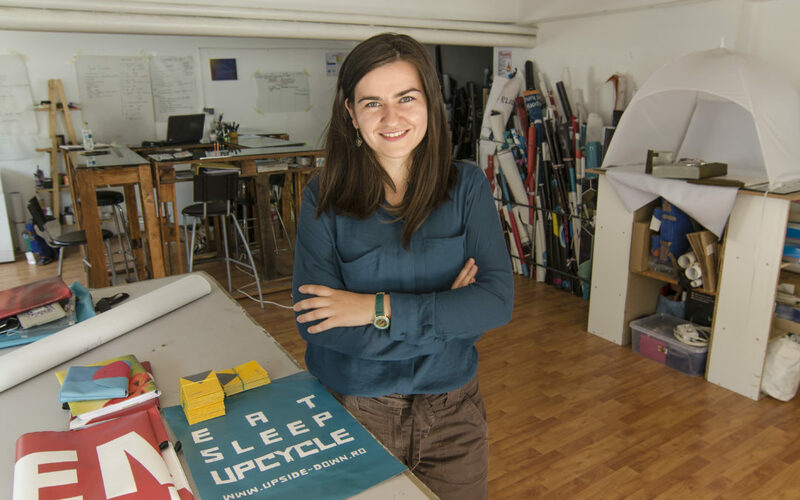 Andreea Zaharescu is the founder and CEO of Upside Down. She started to implement this idea with her friends. She has a bachelor’s degree in marketing. She is very passionate about social business and consumer behaviour. She is learning about the circular economy and circular design. She thinks that we have to change the linear economy into a circular one. Her aim is to produce more products without more waste based on the circular economy. Check out the Social Innovation Academy – the first fully-online management training programme focusing exclusively on social innovation. If you are interested in keeping up with this project, you can subscribe to our newsletter, become one of our friends or follow us on social media (LinkedIn, Twitter and Facebook). We welcome all requests for collaboration here.